Great Northern Railway (Ireland) 4-4-0 locomotive No. 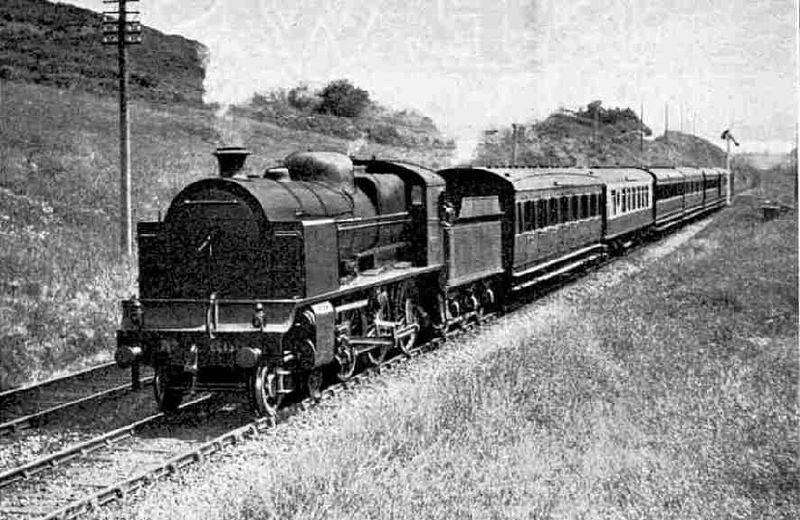 172, “Slieve Donard”, at the head of the Belfast-Dublin “Limited Mail” Express. LAST time the “Irish Mail” carried us from London to the Anglesey coast at Holyhead, and the intervening weeks have doubtless proved sufficient for us to pick a fine day and brave the terrors of the Irish Sea on the way across to what was once “Kingstown”, but is now, in the Erse of the Emerald Isle, “Dun Laoghaire”. As I told you last previously, the name of the Irish port need not frighten you; say “Dun Lairy”, and you will be understood at once. Dun Laoghaire is almost a suburb of Dublin, being only six miles from the heart of the Irish capital. It is finely situated on the south-west side of the broad Dublin Bay, backed up by the bold outline of the mountains of Wicklow, the highest of which - Lugnaquilla - attains to 3,039 ft above the sea. The pier at Dun Laoghaire, on which stands the Pier Station, stretches well out to sea, and on it we find the trains waiting to carry through passengers to all parts of Ireland. There are the brown varnished teak coaches of the Great Northern Railway, destined northward for Belfast; the blue coaches of the one-time Midland Great Western Railway, to cross the country to Galway in the west; and the teak coaches of the pre-grouping Great Southern and Western, on their way south-westward to Cork. The two last-mentioned railways, with the Dublin and South Eastern Railway - to whom the Dun Laoghaire Station belonged and by whose locomotives and lines we obtain access to Dublin - have now all been fused to form the Irish Great Southern Railway. The Great Northern Railway, partly situated in the Irish Free State and partly in Ulster, remains an independent company. All three through portions just mentioned are to go forward from Dublin by “Limited Mail” trains. The Great Northern portion is usually worked in separately, but the Galway and Cork sections travel together, all of them leaving just after 6 o’clock in the morning, directly after the arrival of the night steamer from Holyhead. The first thing that we notice about the stock is that it is of an external appearance and internal comfort quite equal to the best to be found in England. The second thing that catches our eye, probably, is that three passenger classes are still provided in Ireland, second class still surviving, as it does on the Continent of Europe. There is no sign of restaurant car accommodation, but we shall not have long to wait; restaurant cars will be found on each of the “Limited Mails” to which our through coaches will be attached at the Dublin terminal stations, and we may be sure of an admirable breakfast when the time comes. The third thing the expert eye will not fail to detect is that the gauge of the tracks is wider than that to which we are accustomed; actually it is 5 ft 3-in, as compared with the standard British 4 ft 8½-in. The short journey of six miles into the Westland Row Station of the old Dublin and South Eastern Railway is the first break, and we then pass by the “City of Dublin Junction” line on through Tara Street and the centre of Dublin, across the Liffey, and into Amiens Street Station, which adjoins the Amiens Street terminus of the Great Northern Railway. Here the Belfast coaches are attached to the Belfast “Limited Mail”, which is booked to start at 6.40 a.m. and to reach Belfast in the excellent time of 2½ hours for the 112½ miles, with four intermediate stops. The Galway and Cork coaches travel on from Amiens Street round the tortuous course of the old Midland Great Western line, alongside the Royal Canal, as far as Glasnevin Junction, where they separate, the former to be worked into Broadstone Terminus, reversing at Liffey Junction, and the latter into Kingsbridge, reversing at Island Bridge Junction, for the outgoing “Limited Mails” at 7.10 a.m. and 7.0 a.m. respectively. The former, which is the slowest of the three, takes 3 hrs. 40 min. to cover the 126½ miles from Dublin to Galway, while the latter is due in Cork, 165½ miles distant, at 10.55 a.m.
As the best locomotive running is generally performed on the up journeys, we will make for England, instead of getting farther away from home, and we must therefore imagine ourselves at the outward end of the “Limited Mail” journeys, ready to begin the journey back to Dublin. The rolling stock makes the double journey daily. Obviously we cannot be in two trains at once, and so we must take the necessary trips consecutively. GNR (Ireland) 4-4-0 locomotive No. 174 “Carrantuohill”. This locomotive was built by Beyer Peacock & Co. Ltd, Manchester, in 1913, and is one of a class of locomotives famous for their extremely smooth and quiet riding qualities. 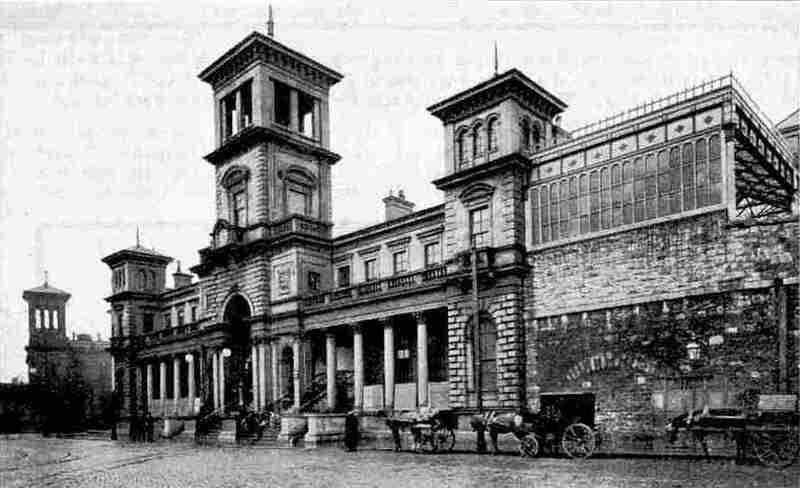 For the first trip, therefore, we present ourselves at the Great Victoria Street terminus of the Great Northern Railway in Belfast soon after five o’clock in the evening; our southbound journey is to commence at 5.30 p.m. The train is of no great weight. On the rear end we notice a slip coach destined for the seaside resort of Warrenpoint, on the coast of County Down, to be slipped at Goraghwood; then follow a large brake and a “tri-composite” coach for Dun Laoghaire, a third-class and a composite third and second-class, a composite restaurant car, second and third-class at one end and first-class at the other, with the kitchen between, and a first-class brake - seven coaches in all. The vehicles are of substantial build, weighing up to 33 tons apiece, so that the whole train scales about 220 tons, and with passengers and luggage 235 tons or so. This is not a tremendous weight according to our current notions in England, but some very heavy gradients are to be surmounted en route. Further, nothing heavier than a locomotive is permitted over the Boyne Bridge, which we shall cross just before Drogheda, and the timings, as we shall see, are astonishingly fast. We make the acquaintance of the first of these “sprints” immediately on leaving Belfast. It is 25 miles from here to Porta-down, where we make connection with the express from Londonderry. For this 25 miles the timetable allows no more than 30 minutes, despite the fact that for the first 16½ miles out of Belfast the line is largely on rising grades, as steep in parts as 1 in 148-248 for 2½ miles. Our driver will probably start gently out of Great Victoria Street, but by the time we pass Lisburn, 7½ miles out, where the line is fairly level, we shall be crossing the “sixty” line, and but little under 60 miles an hour will be maintained up to the miniature “summit” at mile-post 96. From here to Portadown we shall probably have no more than nine minutes left for the remaining 8½ miles, and it will be surprising if we do not exceed 70 miles an hour. On my last southbound journey with this express we touched 74 an hour through Lurgan, and comfortably gained a minute to Porta-down, doing the 25 miles in 29 minutes. The next non-stop stretch is over the 33¼ miles between Portadown and Dundalk, during which we shall cross the frontier between Northern Ireland and the Irish Free State. We shall have the usual forcible reminder of this fact when we stop at Dundalk. For the distance just mentioned the timetable allows exactly 40 minutes, entailing an average speed of the merest shade under 50 miles per hour. But the amazing thing about this booking is that during its observance we have to climb right up through the mountains to Adavoyle Summit, which is 522 ft above the sea! It is approached by arduous grades. Beginning at milepost 74, we have two miles rising at 1 in 115-150 to Goraghwood, and then 6½ miles straight off mostly between 1 in 100 and 115, to mile-post 65½, which marks the actual summit. Not only so, but because of sharp reverse curves at Poyntzpass, between Portadown and Goraghwood, speed must be reduced, at a point where the train is making good speed over the tolerably level stretch of this section of the run. Getting smartly away from Portadown at 6.5 p.m. we shall touch 60 miles per hour, probably, before the Scarva slack, and shall pass that station, eight miles, in about 11 minutes. The slight dip before Portadown should produce a rather higher maximum, probably 65, and we shall then set out in earnest to climb. In the early stages of the ascent, fortunately, we say goodbye to the Warrenpoint coach, which is slipped at Goraghwood, the engine being thereby relieved of 30 tons or so. Goraghwood Junction, 15¾ miles, is passed in about 20 minutes, or slightly less. As we mount over the high viaduct at Bessbrook, the centre of whose 18 arches is 140 ft above the valley, we shall be surprised to find the speed dropping but little, if at all, below 40 miles per hour. The climbing of the fine Great Northern superheated 4-4-0 engines up both ascents to this summit is, indeed, worthy of no small praise. Amid bare and mountainous scenery we breast the saddle between Clermont Carn and Slieve Gullion, and the driver notches up in preparation for the descent to Dundalk. The time up the 6½ miles from Goraghwood to mile-post 65½ has not been more than about nine minutes, and we may now prepare for thrills. Amiens Street Station, Dublin. This station has three platforms and covers 8,398 sq. yards, roofed. Architecturally it might be in almost any part of the Empire. Much of the descent from Adavoyle to Dundalk is at between 1 in 100 and 125, or thereabouts, and the line is well laid out for high speed. For myself, I shall never forget my last trip down to Dublin on the footplate of this very express, when in the driving mist and impenetrable darkness of an October evening, with the engine rolling and surging as though she were a monster alive, we most assuredly touched 80 miles an hour down past “Mount Pleasant” - the signal box and siding that breaks up the long section between Adavoyle and Dundalk. Although we may not repeat the “80” this evening, we may be pretty-sure of something well up in the “70’s”. and probably 75 miles an hour, ere we draw up at Dundalk; and despite our magnificent climbing, it is unlikely that the tight schedule time of 40 minutes has been improved on. It is, in my judgment, the hardest locomotive proposition in Ireland, apart from the comparative lightness of the load behind the engine. Dundalk is reached at 6.45 p.m. The lengthy wait at Dundalk is in curious contrast to the high speed that has just preceded it, but time has to be allowed for the Irish Free State customs officials to come and interview you, and it is to be hoped that they will find no dutiable articles concealed in your baggage, or the wait may be longer still! It is quite likely that the engine will be changed here also, a Dublin engine replacing the Belfast engine for the remainder of the journey. After no less than 13 minutes’ standing, we leave Dundalk at 6.58 p.m. For the next 22½ miles to Drogheda, with their sharp undulations, the allowance is 27 minutes, the booked speed being therefore 50 miles per hour exactly. It should also be mentioned that we have attached at Dundalk a couple of corridor coaches through from Londonderry via Enniskillen and Clones, making up the total load to eight coaches, weighing about 265 tons. We find the observance of the booking from Dundalk to Drogheda presents but little difficulty, however. There is a steep rise at 1 in 160 for 1½ miles out of Dundalk, followed by falling and then level grades to Castlebellingham, on which we get up to 65 miles an hour or so; then comes Dunleer bank, with its five miles up at 1 in 198, to the summit at mile-post 37½ followed by a corresponding descent to Drogheda. Just before stopping at Drogheda we run on to a high embankment, and then across the wide valley of the Boyne by the great Boyne Viaduct, with its three main spans, two of 140 ft each and a centre one of 265 ft, and its approach viaducts consisting of fourteen 60 ft arches. It is this viaduct which, as previously mentioned, is to some extent restricting locomotive development on the Great Northern, as it cannot carry more than certain maximum weights. Drogheda we reach at 7.25 and leave at 7.28 p.m. For the final 31¾ miles of gentle ups-and-downs to Dublin the timetable concedes 37 minutes, but although this means an average rate of 51.5 miles per hour, it is perhaps the easiest booking of the four. Soon after leaving Drogheda we emerge on to the sea-coast, at Laytown, and the rises and falls in the gradients after that mark the points where the line leaves the coast and then rejoins it. Most pronounced among them is the two-mile ascent, mostly at 1 in 150, to mile-post 16, which may bring our speed down to 50 m.p.h; running down the other side of if we shall touch 68 to 70 miles an hour, very likely, as we pass Donabate. The 10 miles from Drogheda to Balbriggan should take 12½ minutes; then the 12¾ miles from there to Malahide 13 minutes; the 4¼ miles from Malahide to Howth Junction four minutes, and the last 4¾ miles into the stop at Amiens Street 6½ minutes, or so, which will bring us in just a minute ahead of time. 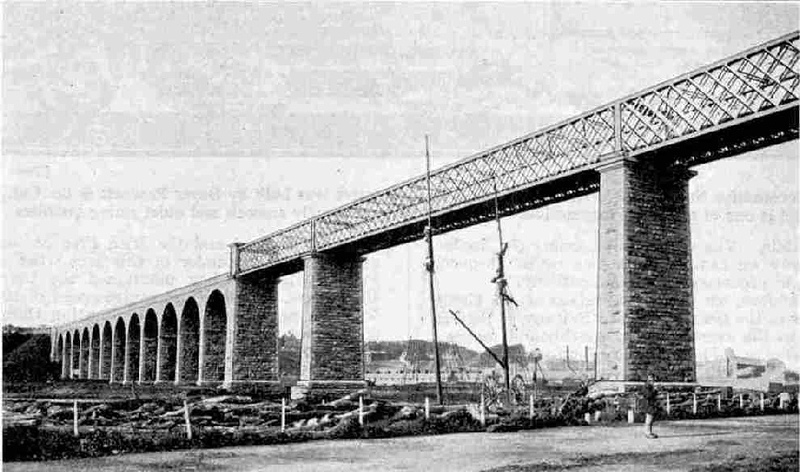 The great viaduct across the River Boyne at Drogheda. This fine bridge was built by Barton in 1854-5. It has three main spans, a centre one of 265 ft and two of 140 ft each, at a height of 90 ft above the river. The approach viaducts consist of 14 arches each of 160 ft span. Our arrival is therefore at 8.5 p.m, 2 hrs. 35 min. after leaving Belfast, and as 21 minutes of this total has been spent in stops, the actual running time of 2 hrs. 14 min. for the 112½ miles represents an average travelling speed of just over 50 miles an hour for the whole distance - an excellent achievement, especially in view of some of the heavy grades surmounted en route. The through coaches for Dun Laoghaire are soon whisked off the rear of the train, but we must leave them and hasten to Cork in order to travel up with the Great Southern Company’s “Limited Mail”. Or “Cobh” as it is now known, but the start is now made from the Glanmire Road Station at Cork, and a terrifically hard exit it is, too. Right from the start, up past Kilbarry to Rathpeacon, the line rises for 3½ miles at 1 in 70 and then 60 - a nice proposition for an express engine making a “cold” start with a heavy train! Then there are 9 miles more of rising grades, 6½ of which are at between 1 in 150 and 1 in 285, ere the summit is breasted at mile-post 151½, 14 miles out of Cork. If our load is anything out of the ordinary, however, our powerful 4-6- 0 locomotive may be certain of pilot assistance over the first 21¼ miles of the run, to Mallow, even though the timetable gives the liberal allowance of 34 minutes for the distance. It is difficult to lay down any precise load for the Cork “Limited Mail”, as it varies a good deal according to the season, and according to whether any liners have been calling at Queenstown. We may expect, however, to have not less than seven or eight vestibuled coaches out of Cork, of much the same weight as those of the Great Northern line, and very probably more than this later on in the journey. It was the old Great Southern and Western Railway that introduced the first 4-6-0 engines to Ireland, as far back as 1905, but they were freight engines. 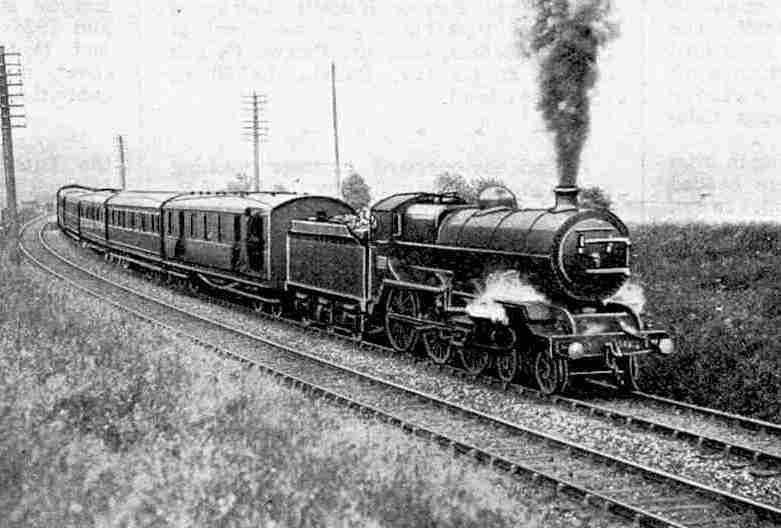 Not until 1915 did the first 4-6-0 express engines, designed by Mr. E. A. Watson, make their appearance on Irish metals, and the same railway was responsible. These were four-cylinder locomotives, strongly reminiscent in external appearance of the Great Western “Stars”, with the outside cylinders set well backward of the centre-line of the bogie, to drive the middle pair of coupled wheels; while the inside cylinders, advanced correspondingly forward, drove the leading pair. Subsequent experiments have given the Great Southern locomotive authorities a preference for two cylinders, however, and the latest 4-6-0 express engines have therefore two outside cylinders only. One of these fine modern engines we may expect to see at the head of our train. It is nothing unusual for the pilot from Cork to Mallow - the locomotive most readily available at the moment - to be a 0-6-0 freight engine, and the combination of dignity and impudence is then a quaint sight indeed! Down Dublin-Cork Mail hauled by four-cylinder 4 6-0 locomotive No. 407. Killarney line to the westward, and the Fermoy and Waterford direction to the east. Four minutes are allowed for this purpose and we get away at 4.30 p.m.
Out of Mallow our locomotive has another bad start, though far from being as formidable as that out of Cork. The rise in this case is for four miles at 1 in 151, to a siding rejoicing in the singular name of Twopothouse. To pass the summit at the 140 milepost, 4½ miles from Mallow start, we may expect to take at least eight minutes, but after that the gradients are mostly with the engine for the next 16 miles, on past Buttevant and Charleville, over which we may expect to average 60 miles an hour or slightly over. From the 124 to the 112 mile-post the inclination is a little the other way, but 13 minutes should suffice, and a short and sharp descent brings us to Limerick Junction. This is a peculiar station, very similar in design to Cambridge of the LNER, having one long platform, looped off the main line, at which both up and down trains stop. Unlike Cambridge, however, the stopping trains run through past the platform, and then back into it, for which operation time has to be allowed in the schedule. For the 37¼ miles from Mallow to Limerick Junction the booked time is 45 minutes, but we must make a start-to-stop run of 37½ miles in not more than 43 minutes, in order to allow two minutes for backing ¼-mile into the platform. This entails an average running speed over this sharply undulating road, of 52.3 m.p.h. Just about here the Galtee Mountains are very prominent on the right-hand side of the train, about 10 miles away, dominated by the fine shape of Galtymore, 3,015 ft in height. 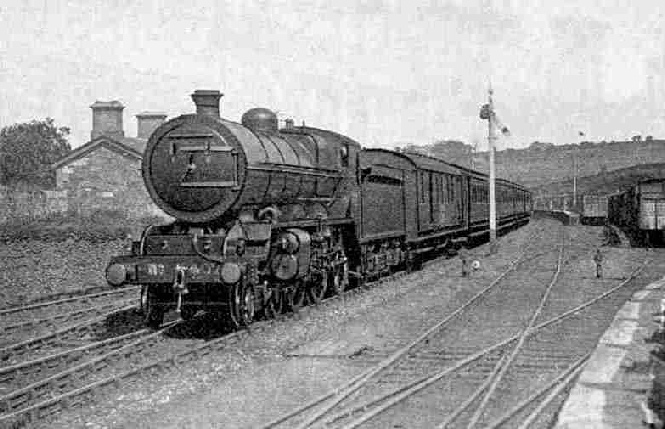 The 12.30 p.m. Cork-Dublin express hauled by two-cylinder 4 6-0 locomotive No. 500, fitted with Weir feed pump and feed water heating apparatus. We reach Limerick Junction, where, as its name implies, the connection comes in from Limerick as well as a connection from Tipperary, at 5.23, and get away at 5.28 p.m. Gentle ups-and-downs now lie ahead, nowhere steeper than 1 in 180 or 200 and of no great length, throughout the next stretch of 40½ miles to Ballybrophy. This is the fastest booking of the journey, only 45 minutes being allowed, which requires an average speed of 54 m.p.h. The chief purpose in stopping at Ballybrophy, which is almost exactly the midway point of the journey, is that our engine may take water, the Irish lines being unprovided with water-troughs. Ballybrophy is reached at 6.13 and left at 6.17 p.m. The next run, to Maryborough, is short. The 15¾ miles are allowed 20 minutes, and as, 1½ miles out of the Ballybrophy start, we strike three miles of downhill at 1 in 128, and there are other favourable grades, the booking very likely proves quite a minute more than we require. The Slieve Bloom Mountains, away on the left-hand side of the train, relieve what is otherwise some very flat country hereabouts. Dublin is now the next stop ahead. We are 51 miles distant and, reaching Maryborough at 6.37 and leaving at 6.42, we have 58 minutes left in which to complete the distance, at an average speed of 52.7 m.p.h. From Maryborough we have an excellent downhill start of 1½ miles at 1 in 170, and, indeed, grades generally falling for some 11½ miles in all. We swing through Portarlington, 9¼ miles, in 11 or 12 minutes, and hurry up the four miles at 1 in 180 past Cherryville Junction into Kildare, without the speed falling much below 50 m.p.h. Kildare, 20¾ miles, is passed in 24 minutes at most. The flat plain of the Curragh, so extensively used for military purposes, appears on the right, backed up in the distance by the mountains of Wicklow, to which we draw gradually nearer as we approach Dublin. All the difficulties of the journey are over, and for the final 27½ miles nothing but falling grades lie ahead. This final schedule, indeed, proves a useful “recovery” margin for time lost earlier in the journey. So we pass Newbridge, Sallins, Straffan, Lucan and Clondalkin; the descent steepens past Clondalkin, the final four miles - a hard start for southbound trains - being at 1 in 169, then 138, then 104 and last of all 81 as we pass Inchicore. The birthplace of our locomotive is seen at the Inchicore Works, on the right of the train, and then we drop into Kingsbridge. The time is 7.40 p.m, and we have made our journey of 165½ miles, with four stops totalling 19 minutes, in 220 minutes - an excellent piece of locomotive work. Erin need fear little in the comparison of her express running with that of Great Britain. Up English Mail with four-cylinder 4 6-0 locomotive No. 403. You can read more on “The Irish Mail”, “Ireland’s Railway Systems”, and “The Ulster Express” on this website.